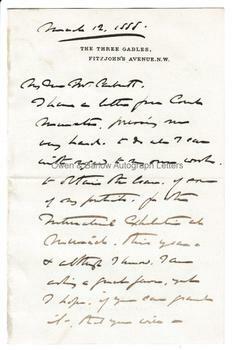 FRANK HOLL Autograph Letter Signed. English painter, particularly of Royal portraits. ALS. 4pp. The Three Gables, Fitzjohn's Avenue NW. March 12th 1888. To E[dward] H[amer] Carbutt. "I have a letter from [. . .?] pressing me very hard to do all I can with regard to my own work to obtain the loan of some of my pictures for the International Exhibition at Munich this year, and although I know I am asking a great favour, yet I hope, if you can grant it, that you will. I want you to lend your portrait. The agents for the Exhibition collect pack and deliver and return again to the house from where they take it. The Munich Ex[hibition] insures. The Exhibition is from May to end of October inclusive. Pictures would have to leave from the end of April and be returned about middle of November. Please let me know as soon as you are able. Most probably the Middle Temple portrait of the Prince of Wales will go. I also hope that of Sir George Trevelyan and Tenniel's portrait. Now do you feel inclined to help our Artists Fund Benevolent Institute by being a steward and asking amongst your friends to come to your [. . .?]. Excuse me asking these 2 favours and with our united very kind regards, Frank Holl." 12mo bifolium. 15.5 x 10 cms (6 x 4 inches). Very slight mounting traces to edge of verso of last leaf, else fine. Frank Holl was a portrait painter who was very much in demand by Victorian society. His major commissions included Queen Victoria, W.E. 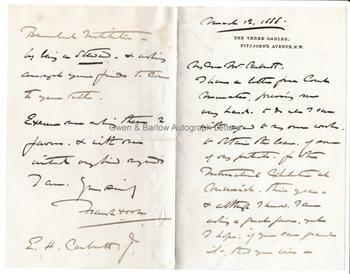 Gladstone and	Field Marshall Lord Roberts in addition to the portraits of the Prince of Wales and John Tenniel mentioned in this letter. He was quickly overwhelmed by commissions and he rarely, if ever, turned any away. This caused him to overwork and probably contributed to his early death. 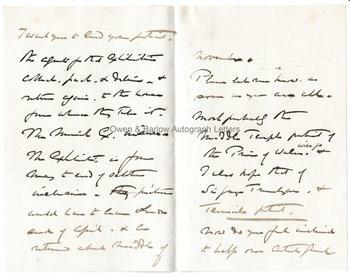 Sadly, Frank Holl would never see the end of the Munich Exhibition of his work as he died on 31st July 1888, less than 5 months after the date of this letter. His correspondent here is Edward Carbutt who was President of the Institute of Mechanical Engineers.